Blockchain technology is one of the fastest growing sectors in the tech space, and blockchain jobs are in high demand. 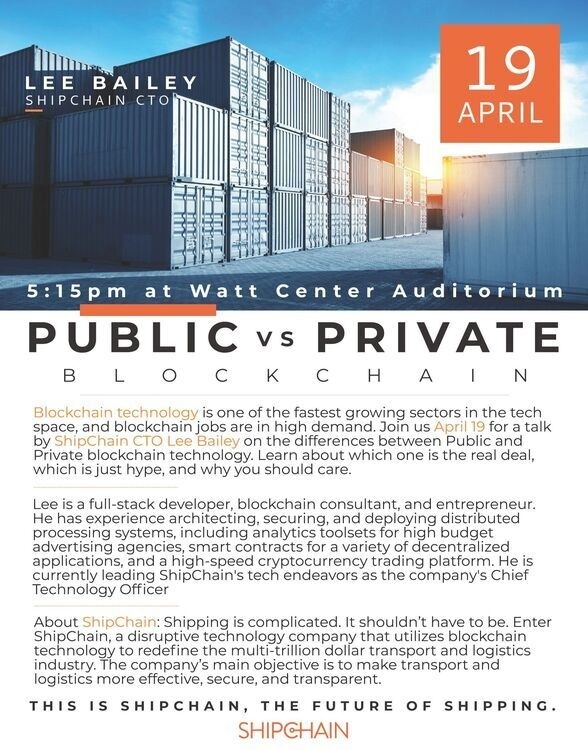 Join us April 19 for a talk by ShipChain CTO Lee Bailey on the differences between Public and Private blockchain technology. Learn about which one is the real deal, which is just hype, and why you should care. About ShipChain: Shipping is complicated. It shouldn’t have to be. Enter ShipChain, a disruptive technology company that utilizes blockchain technology to redeﬁne the multi-trillion dollar transport and logistics industry. The company’s main objective is to make transport and logistics more effective, secure, and transparent.